This episode of Eat This Podcast is only tangentially about what people eat. At its heart, though, it is about how what people leave behind affects the other animals that eat it. Hunters routinely clean up the animals they’ve shot out in the field. That leaves a gut pile, consisting not only of the guts but also, usually, the heart and lungs and any meat damaged by the bullet. The hunter takes home the meat and scavenger animals get to snack on the gut pile. It’s been that way for a long time. Unfortunately, recent research has shown that much of the gut pile, and some of the meat the hunters take home, is contaminated with microscopic pieces of lead. That could be damaging the people who eat the meat, and it has been accused of hampering the recovery of the Californian condor. I heard the story from Matt Podolsky, a wildlife biologist and film maker who worked with the condor recovery programme. That’s him (in the hat) with one of the condors; even the size of that tag doesn’t give a very good impression of the size of the bird. Matt Podolsky’s film Scavenger Hunt tells the story of the efforts to persuade hunters in Arizona to adopt non-lead ammunition. 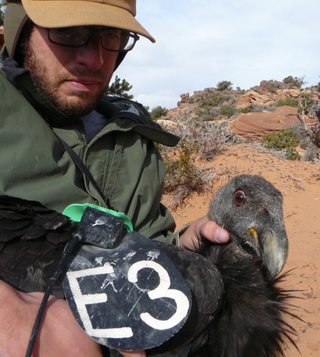 Not everyone agrees that lead in deer carcasses is the main source of lead in condor blood. Start here. Banner photograph of the Vermillion Cliffs, site of the Arizona condor releases, by Jerry and Pat Donaho. Chef and hunter talk on Nordic Food Lab Radio. Beware, it auto-plays. It is a good thing I don’t have a loaded weapon any time I visit SoundCloud. And if you want to know more about my close encounters with Californian condors, you’ll have to find a copy of my book Zoo 2000 or persuade me to scan and share the relevant pages. I no longer have any copies of the TV shows on which it was based, although there is one on YouTube.